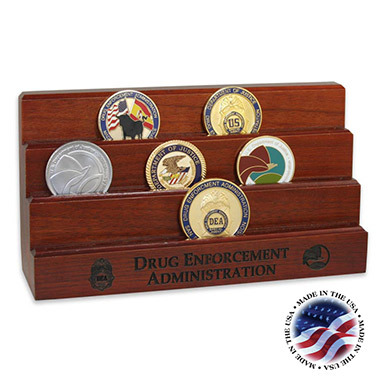 Home : DEA Seal Items : DEA COIN DISPLAY 8"
A USA MADE solid wood coin-ready display in a beautiful cherry finish. Holds 12 coins at 1.75" diameter or 15 coins at 1.5" diameter. Actual width 8.25" wide. Note: Includes 2 keyholes on the back so that it can be hung on the wall.